Many of us have the firm belief that Ayodhya, for which the Brahminical Hindus have been shouting loud to develop into a Holy place of Hindus, actually belong to Buddhists. My dear friend Vinit Maurya is now a party in the Ayodhya case seeking to hand over the entire land to Buddhists and asking the government to release the details of the digging happened there. Ayodhya has numerous Buddhist places which have been damaged, coopted as Hindu temples or destroyed. If you see the region, Ayodhya actually falls in the Buddhist circuit. From Ayodhya the famous Buddhist Shrine of Shravasti may not over 125 kilometer. The other important shrine is Sarnath, about 200 kilometres away, and Kushinagar, not more than 100 kilometres away. Ayodhya has been a place of Sufism too where numerous sufi saints came and lived thereafter. It is not that we are denying the importance of it for the Sanatani Hindus but frankly speaking Rama is not the biggest of the Hindu Gods who are actually Brahma Vishnu Mahesh but brahmanism confuse everything. It try to defend irrational things through creating false assumptions and converting them into 'leelas'. Anyway, I have always been curious about Ayodhya's Buddhist past and whenever I visit to South East Asia, I feel proud as an Indian where Buddha was born or got enlightenment. There is so much in common but never really appreciated by Indians. Buddhism was the link for India to become a world leader but rather Indians have been left far behind in many things. Thailand is a growing economy, a destination every tourist want to be in because things are so easier and smooth here for them, unlike the paparazzi at different tourist destinations who are ready for a 'grab' once they get an international tourists. People feel uncomfortable visiting without an acquaint in India. Today, I had a dream come true. Even when I had visited Thailand many times in the past, I could never visit the place I had been wanting to visit. 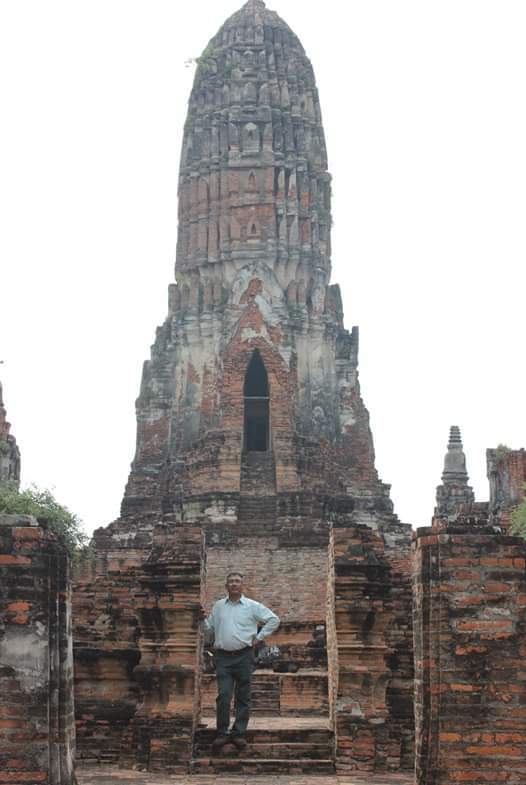 Ayuththaya actually was the second capital of Thailand in the 13th century, to be precise from 1350 to 1767. The ruins of stunning architecture and iconic statues of Buddha by the Burmese invaders who slaughtered the people, destroyed the temples as well as different art work of international variety here in the form of statues and architecture on April 7, 1767. 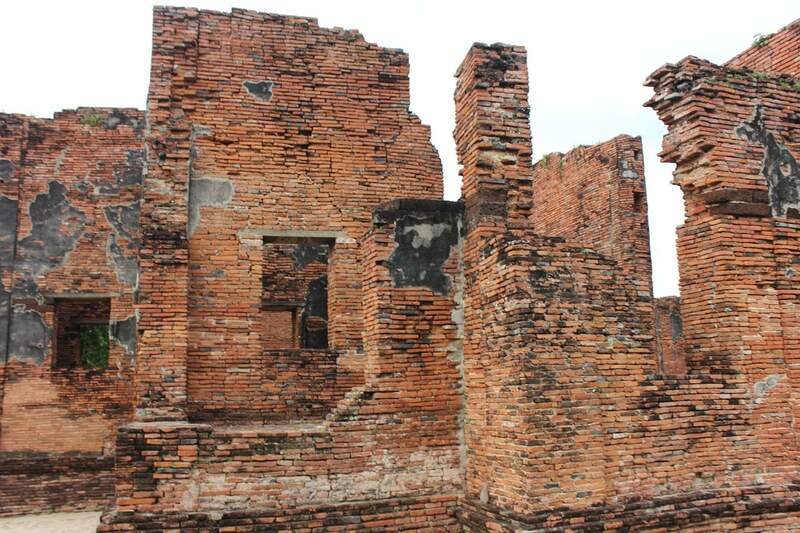 Ayuththya's ruins shows that it was a rich civilization and that is why it was the capital Siam for over 400 years. Historians here believed that Ayuththaya was actually taken from Ayodhya in India. My immediate thoughts goes as to why should a Buddhist civilisation was be built on a Hindu construct, that this Ayodhya was a rich place in 1350. Tulsi Das wrote about Ayodhya and Lord Rama in the 16th century. Secondly, if the Thai kings were bringing Ayodhya from Hindus, we should have more Hindu structures here, but in this Ayodhya, we only found Buddha, Buddha and Buddha. There is no Rama here, though the Sanghis want a Rama Temple to be built up here. If there are linkages between Ayuthathaya and Ayodhya then it must be Buddhist and not really Sanatani. Indian historians have not written about it. 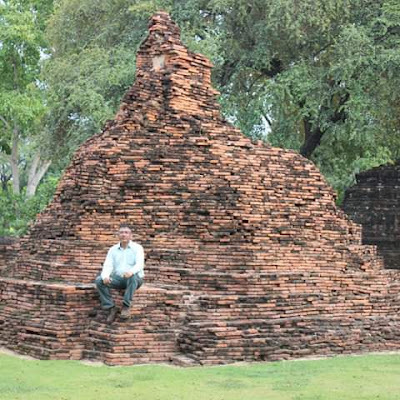 I am surprised that this issue of Ayuththaya hardly come into our discussions that it has historically Buddhist past and now the Thai connection proves it. 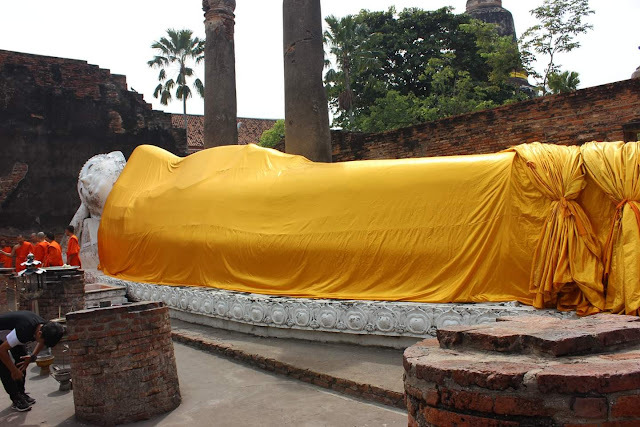 The huge reclining Buddha of about 18 ft is a place where a huge number of tourists visit. We have this in Kushinagar, but in Thailand this is at every major Buddhist temple. The other structures are the Historical Park of Ayoththaya, which are the ruins during the Burmese invasion. I am proud to be here, and at least sharing this information with people, that Ayodhya definitely has a Buddhist history destroyed and hidden by the brahmanical historians and academics. Another important point that is worth explaining is the destruction of Ayuththaya by the Burmese. I don't know their religion but definitely they were not Muslims. They were afraid of Buddha and Buddhist civilisation and that is why it reminds us the fact of history that despite all the efforts of these royal goons, murderers and plunders, you can not destroy an idea. Buddha was an idea from which the world benefited extraordinarily. These ruins gives us painful reminders that there is so much to learn from history; that in today's time, we can learn that vengeance is not the answer, neither it is Buddha's way of thinking. Buddhism has grown leaps and bounds. Individuals are taking deep interest in it and societies embracing it are far better. We talk of so many civilisations but I don't know whether our students have been told of Ayuththya and its rich historical heritage which is its Buddhist past linked to city of Ayodhya. These ruins give us lessons that hatred takes us nowhere. It destroy everything but the idea which talks of inclusion, equality and liberty survives. Those who try to plunder a civilisation or a community with hatred in their mind, in their arrogance may damage many things but do not survive at the end. It is the grit, the value of togetherness, love and work that takes people further. Rich art work, architecture, Buddhist sculpture might have got destroyed including the wealth of the city yet it is reviving, Thailand has survived and surpassed Burma in every possible indicators of human development. The Burmese state itself has become prisoner to dictatorship of the armed forces for years and still not recovered. I am extremely thankful for my cab driver, a Buddhist, who took me to the long drive about 80 kilometres from Bangkok to Ayoththaya, and also helped me taking some of snaps of mine which have become memorable for me.